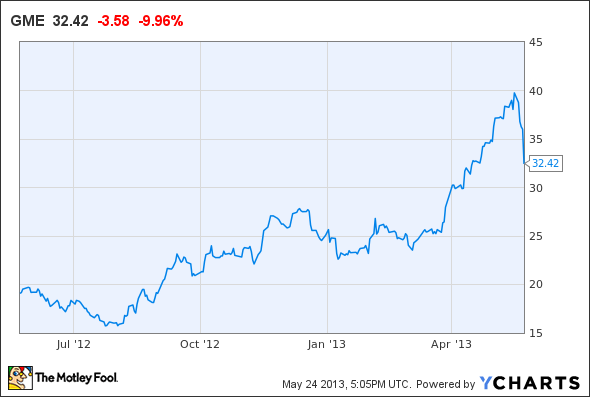 Shares of GameStop have doubled since hitting a 52-week low near $15 last summer. However, GameStop stock dropped precipitously last week, from more than $39 on Monday to $32.35 by early Friday afternoon. GameStop Stock, 1-Year Price Chart, data by YCharts. Which of these is the "real" GameStop? Is this a long-undervalued stock finally getting its due, or a falling knife? I think the latter is more likely to be the case. The GameStop business model is being disrupted from multiple angles, such as: (1) the growth of mobile gaming, (2) new innovations that will enable "cloud"-based gaming, and (3) changes in the video game distribution landscape. As a result, while management is confident that the company will return to earnings growth next year, I think the company could be entering a permanent decline. The launch of new game consoles from Sony and Microsoft could provide a brief boost, but no more. As a result, GameStop stock -- which still trades for more than 10 times earnings -- could decline much further. Mobile games are obviously not as good as console video games or PC games. However, for many casual gamers, mobile games will be "good enough." The widespread penetration of smartphones and tablets means that most people now have a mobile gaming device. Moreover, NVIDIA is betting that the shift to mobile gaming will go beyond casual gamers. The company recently launched "Project Shield": an Android-powered mobile gaming device that includes a console-quality controller. While GameStop may make some money from hardware sales of the $349 Shield, software sales will all go through the Google Play online store. This is critical, because GameStop's gross margin on hardware last year was just 7.6%. The company really sells new gaming hardware in order to drive more profitable software sales. If the software revenue stream starts to dry up, GameStop stock is likely to hit further turbulence. Another risk for GameStop stock is the potential for wholesale disruption of the game console market. NVIDIA is a threat here, as well. The company is building GPUs for server environments, which could allow the streaming of video games. The graphics will be rendered by cloud-based GPUs and the video output sent to the user's TV, tablet, or other screen, while controller input will be sent back to the server. NVIDIA has stated that this new platform (called GRID) will have latency similar to a traditional console. By centralizing the hardware, it will allow game creators to create software-as-a-service offerings. This new business model would eliminate the up-front hardware and software costs associated with today's game consoles, which would be popular with many gamers. As a result, cloud-based gaming could significantly disrupt the console market over the next few years. GameStop would be a clear loser from this development. GameStop's biggest competitive advantage is as a middleman in the used-game market. The company earns very high margins by buying and selling used games. Used video games accounted for 30.7% of GameStop's revenue last quarter, but nearly half of the company's gross profit. The health of this business is key to keeping GameStop stock afloat. However, console manufacturers and software publishers would prefer to see higher sales of new games rather than lots of trading. Failing that, they want a cut of the profits from trade-ins. Microsoft is pursuing this goal very directly. The new Xbox One console will require online activation of games, which gives Microsoft complete control of the trade-in market. Trade-ins will still be permitted, but the lion's share of the profit will be taken by Microsoft and the game publisher, according to Forbes contributor Erik Kain. This could leave gross margin for retailers like GameStop as low as 10%, compared to the 47% margin GameStop recently achieved on used games. While Sony and Nintendo do not seem to be taking such a draconian tack yet, Xbox is the leading game console platform in the U.S., GameStop's primary market. A significant decline in the profitability of used Xbox game sales would be a major blow for GameStop. GameStop's management has taken a very shareholder-friendly stance by committing to return 100% of free cash flow to investors. This seems to have driven GameStop stock's strong performance over the past year. Unfortunately, the long-term disruptive threats I laid out above are likely to lead to sharp erosion in the company's FCF. It is possible that GameStop will manage to adapt to the quickly evolving market, especially if the release of new consoles from Microsoft and Sony this year drive a strong upgrade cycle. However, the company faces too many serious competitive threats to give GameStop stock an acceptable risk-reward profile. Investors might do well to consider avoiding the stock. The article Don't Put Your Faith in GameStop Stock originally appeared on Fool.com. Fool contributor Adam Levine-Weinberg owns shares of NVIDIA. The Motley Fool recommends Google, Nintendo, and NVIDIA. The Motley Fool owns shares of GameStop, Google, and Microsoft. Try any of our Foolish newsletter services free for 30 days. We Fools may not all hold the same opinions, but we all believe that considering a diverse range of insights makes us better investors. The Motley Fool has a disclosure policy.